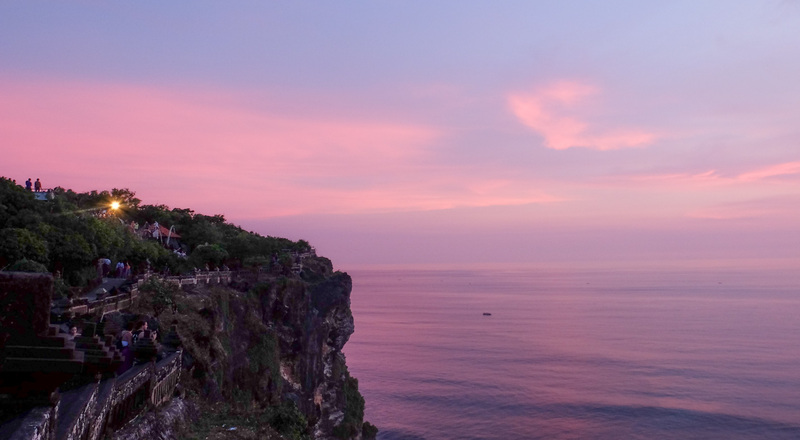 The only guide you need for an often forgotten part of south Bali — Nusa Dua and Uluwatu. 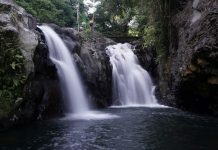 Check out these exciting activities, drop-dead-gorgeous sceneries, and must-eat local delights! 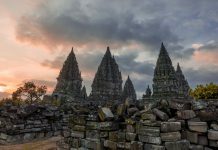 Located in the southernmost part of Bali, Nusa Dua is often known characterised as an “upscale” area dotted with luxury resorts. 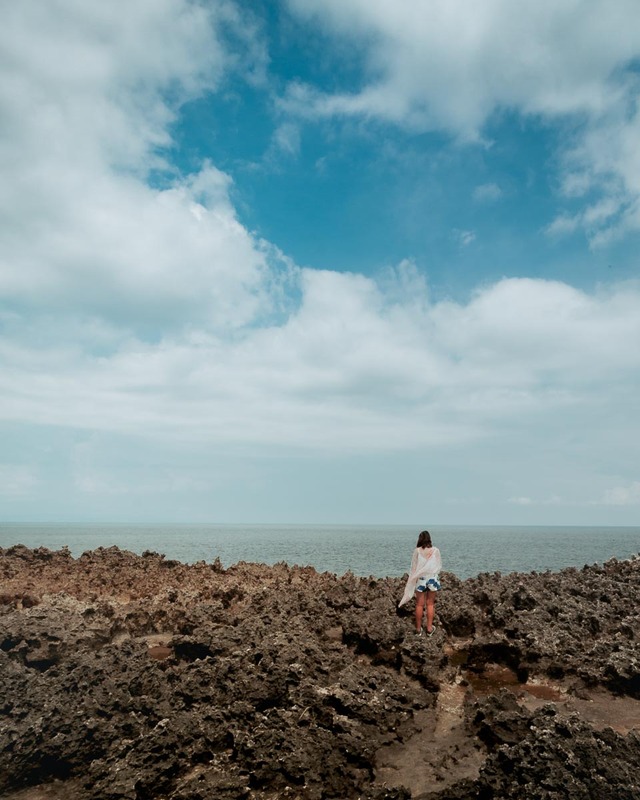 There’s a reason why Nusa Dua is marketed that way — the abundance of rocky limestone cliffs with thick greenery are sceneries many would pay just to get a glimpse of. While accommodation may be on the higher end, what most don’t know is how reasonably priced everything else is! 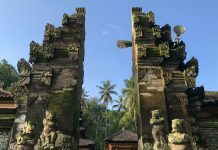 Here’s our guide to how you can explore the southern peninsula of Nusa Dua in 48 hours. Public transport is sparse in this part of Bali. If you’re not hiring your own vehicle, we recommend hiring a driver. We hired ours from Klook for ~S$42/day. 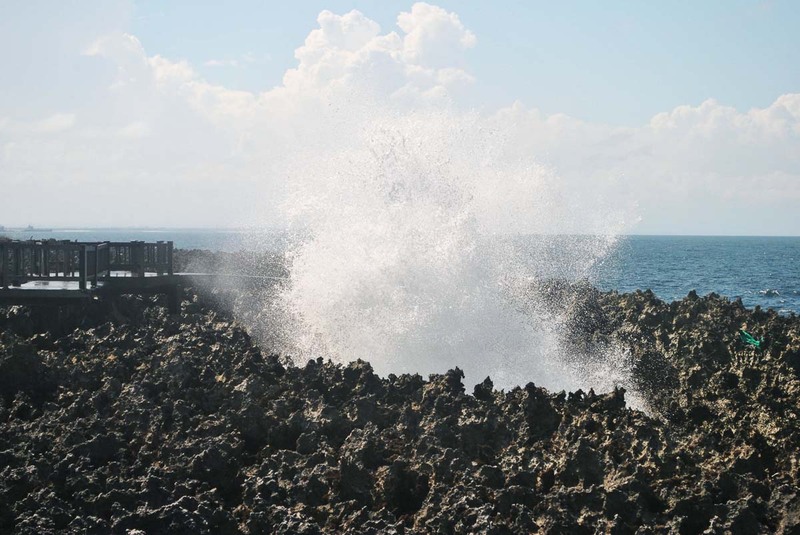 Located at the Nusa Dua beach is the Waterblow, where a giant splash of seawater “blows” up like a whale’s spout as waves hit the rock. Witness the best moments of this breathtaking natural occurrence during the months from July to October where the tides are higher. If you are visiting Nusa Dua out of the above mentioned period, it’s still worth a visit as the rocky coast make a unique backdrop for a photo op. 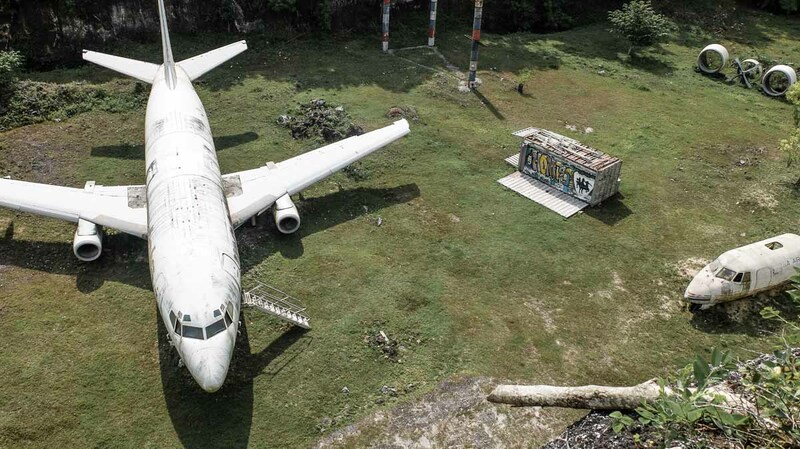 If you are one who’s in for the obscure, there’s an abandoned Boeing 737 sitting in the middle of nowhere. 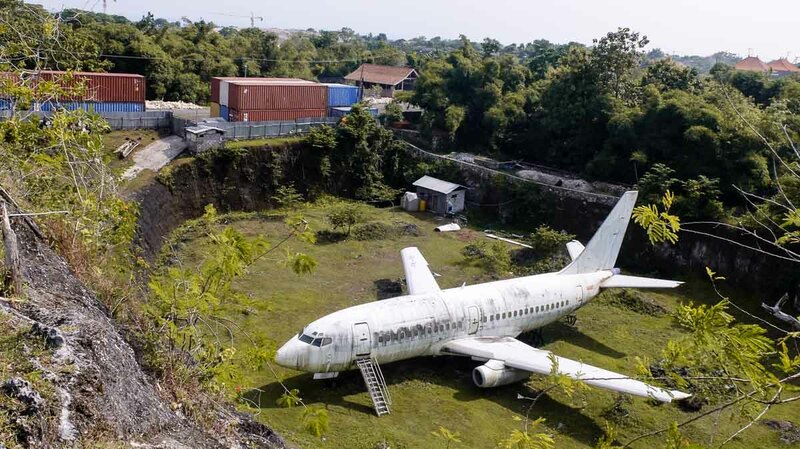 Rumour has it that the airplane was acquired to be repurposed as a restaurant, but it never materialised. Never mind the failed business plan, because this hidden find is now a hotspot among Instagrammers. Do note that the path up the abandoned plane is very bumpy. *Pro-tip: Take the beaten path next to the makeshift drink stall for a free access to the vantage point to view the plane. Go big or go home. 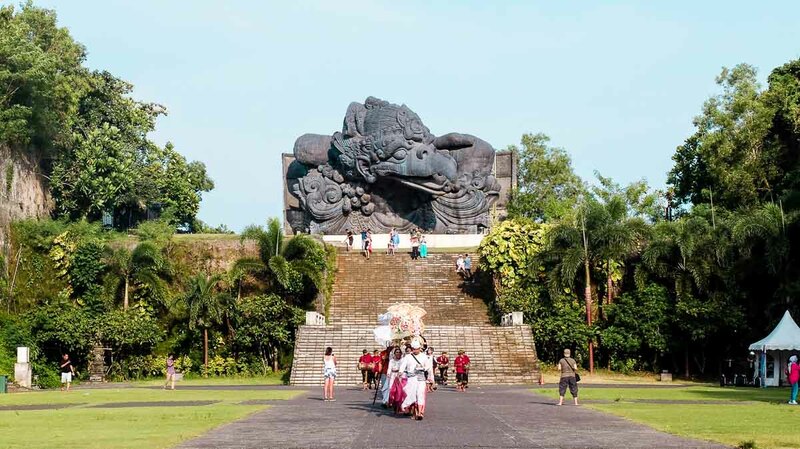 That’s probably what the Balinese had in mind before they constructed the gigantic gargantuan statue of Lord Vishnu. When completed, the monument will stand at 121m (30m taller than Statue of Liberty!) and will be the tallest statue in the whole of Indonesia. 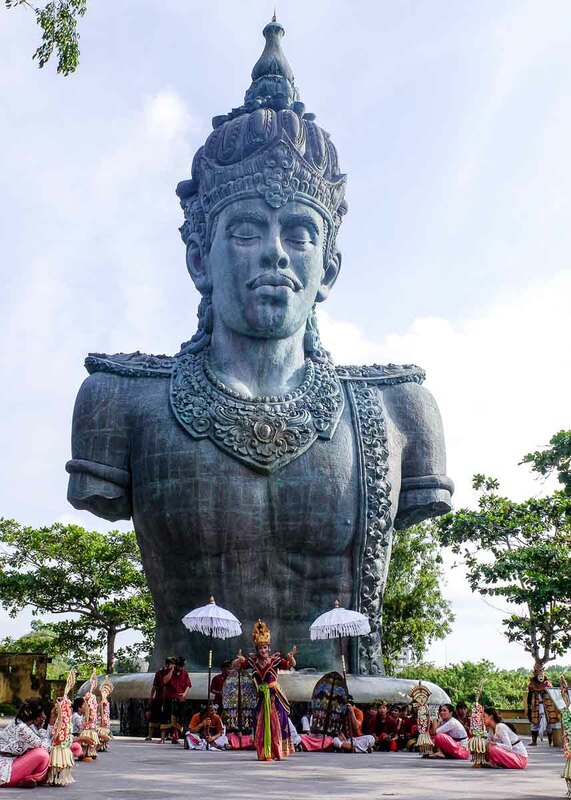 At the moment, Garuda Wisnu Kencana Cultural Park already has a 23m tall bust of Lord Vishnu where cultural performances are held at several timings per day. Bali is known for her gorgeous beaches, but many such as the Jimbaran Beach, are heavily commercialised. 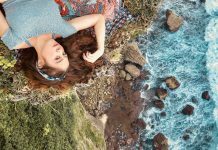 Suluban Beach, however, is pretty secluded, and one will need to walk through several terrains before reaching the beautifully untouched beach. Prolonged weathering of the rocks have created beautiful rock silhouettes along the coast. You can dip yourself in the shallow parts of the beach (in the potholes) while watching surfers catch on waves. *Pro-tip: Visit between 4:30PM – 5:30PM for the best sunset views. 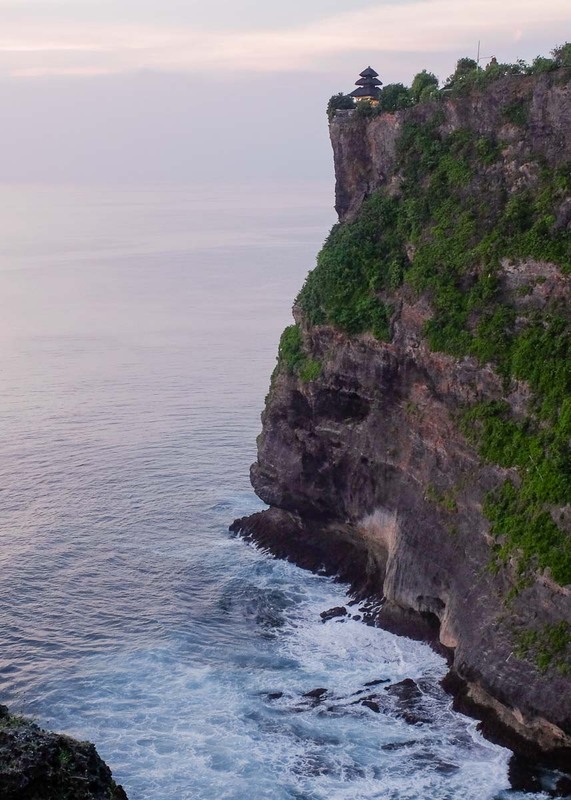 Uluwatu Temple is perched on a 70 metre-high cliff and is the most famous Balinese sea temples in Bali. The famous Balinese Kecak dance is also performed there at 6PM daily. 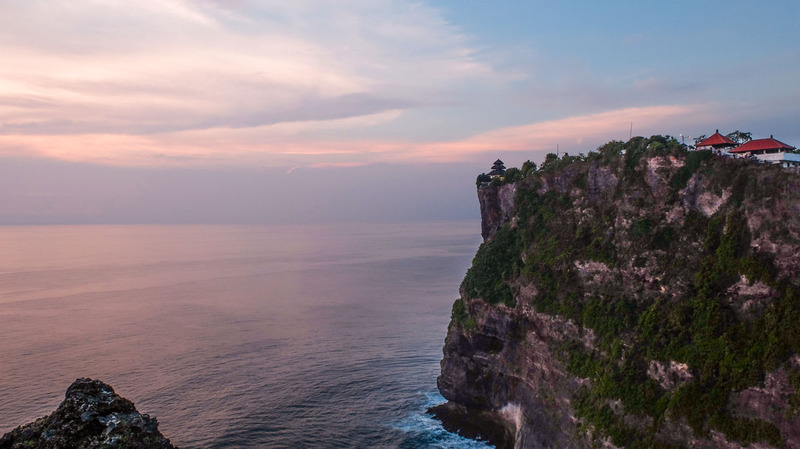 Catch the amazing sunset at Uluwatu Temple, where the orangey sky and clear blue sea frame the perfect photo spot of the temple on the cliff. What’s a trip to Bali without some salt in your hair? 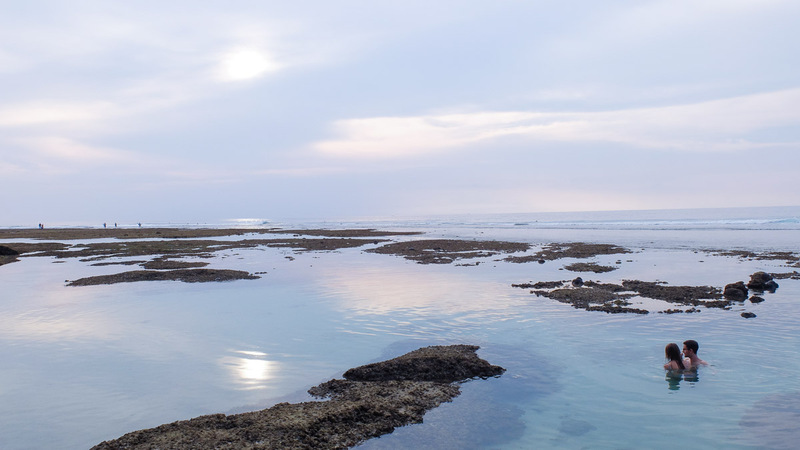 Nusa Dua and Uluwatu have some of the nicest and untouched beaches in Bali. 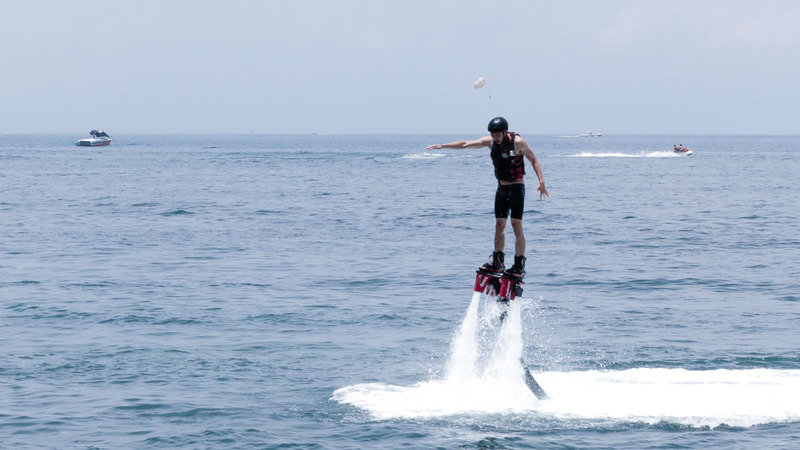 If you are one who enjoys water sports such as the Banana Boat, Parasailing, and Flyboard — they are available at Nusa Dua Beach. The instructors are extremely patient, even towards a total noob like me. While such water activities look easy, the scorching sun can actually tire you out very easily. Do stay hydrated and slap on more sunblock! 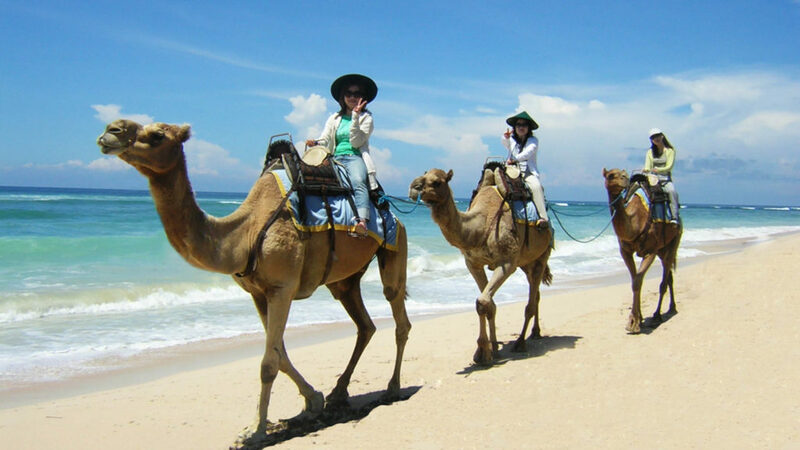 While it’s not uncommon to find vendors offering horse-riding experiences by the beach in Bali, have you heard of camel rides? There are 30 and 60 mins camel rides by the beach available, and slots are limited so do make a booking at least one day in advance if you’re interested in this unique experience. 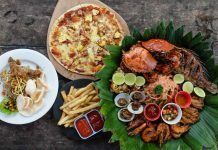 Bali has a lot of trendy cafes in the recent years, and if you are looking for one in Nusa Dua, Pirates Bay Cafe could just be your best bet. 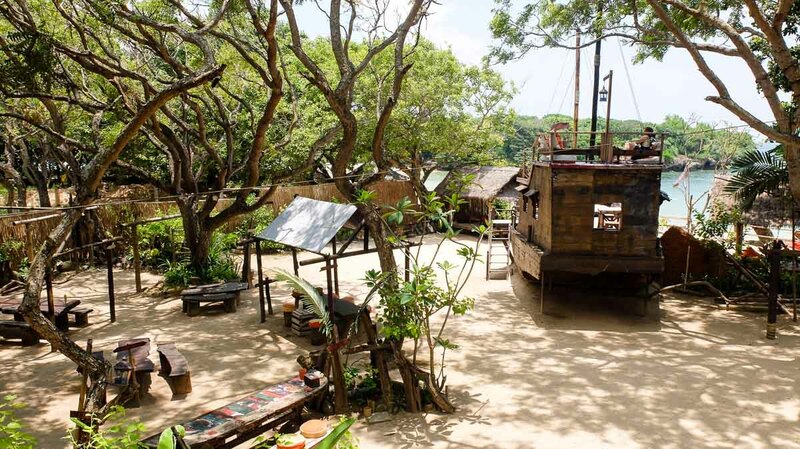 The pirate-themed open-air cafe sits by the shore of the ITDC area. 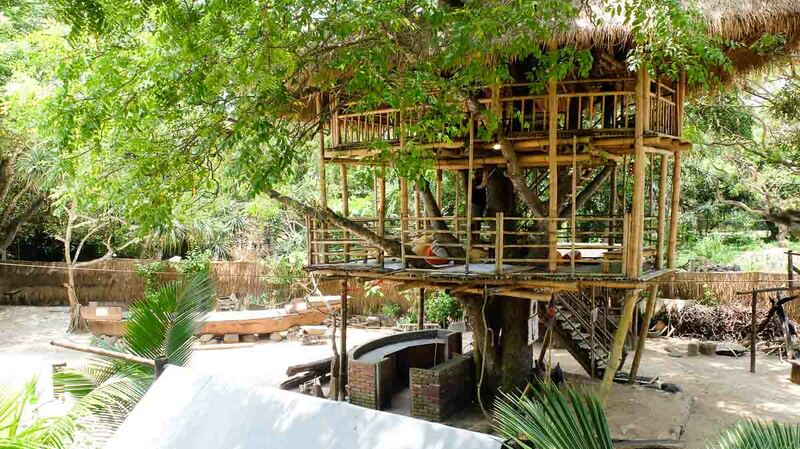 The dining areas are bamboo tree houses shaped in ships, and if you spend above Rp150,000 per pax, your party can sit up at the higher levels of the treehouse and enjoy the view. We enjoyed the seafood platter (Rp 550,000) which had crabs, prawns, clams, and fish! It was definitely a feast, and we had a great time just chilling and watching the beachgoers from our elevated dining space. 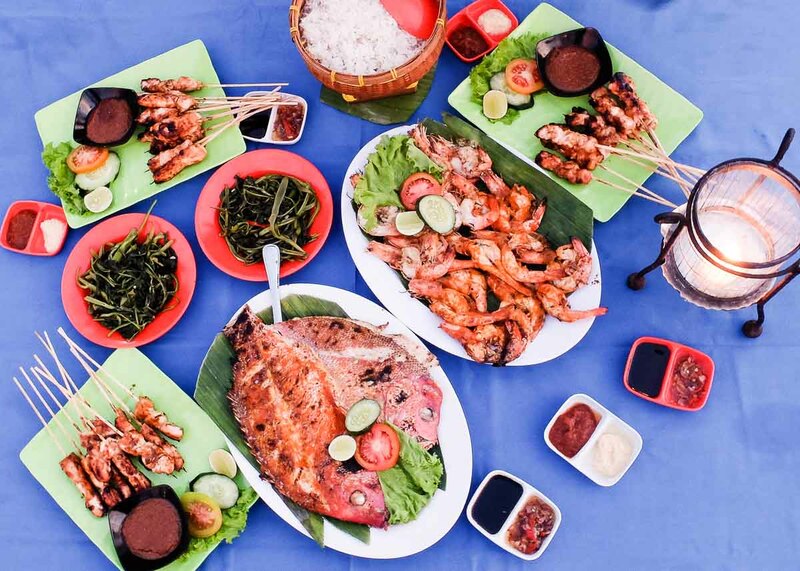 Nusa Dua is a fairly upscale area, and while it’s not difficult to find Balinese food, most people find themselves heading to western cafes and restaurants. 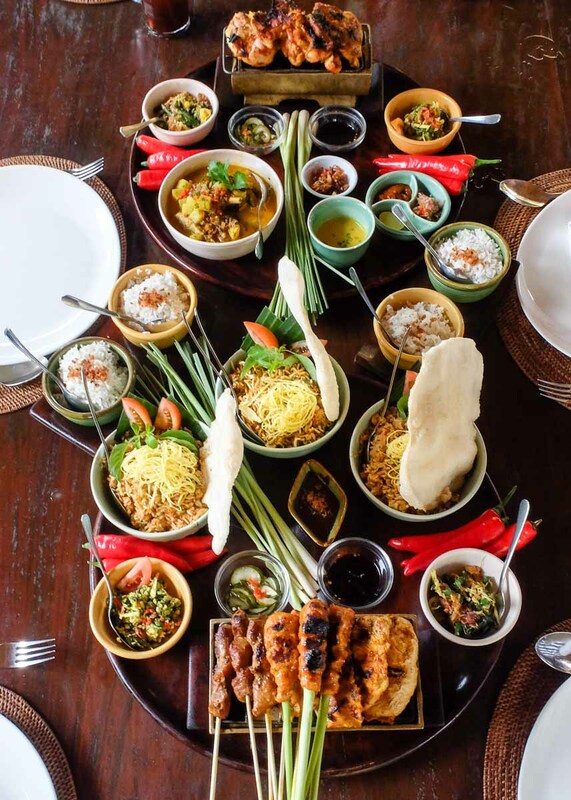 Bumbu Bali is located just 5 mins from Nusa Dua Beach, and they serve good food in good portions, and a nice setting to chill. 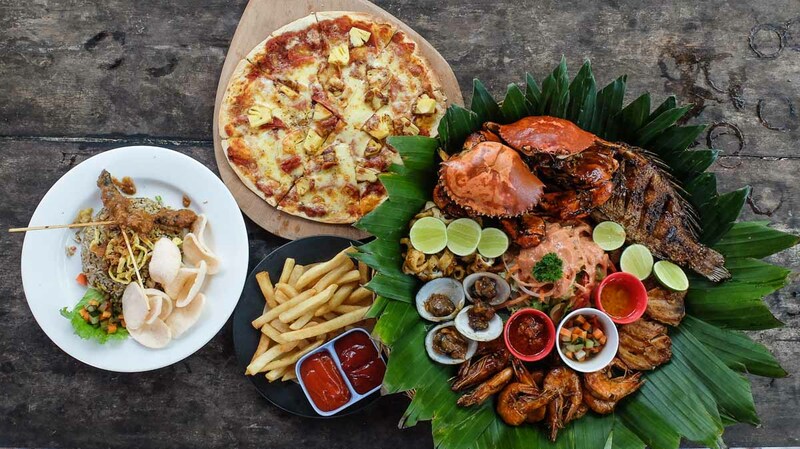 Be prepared to set yourself back at least Rp150,000 if you order food and drink. 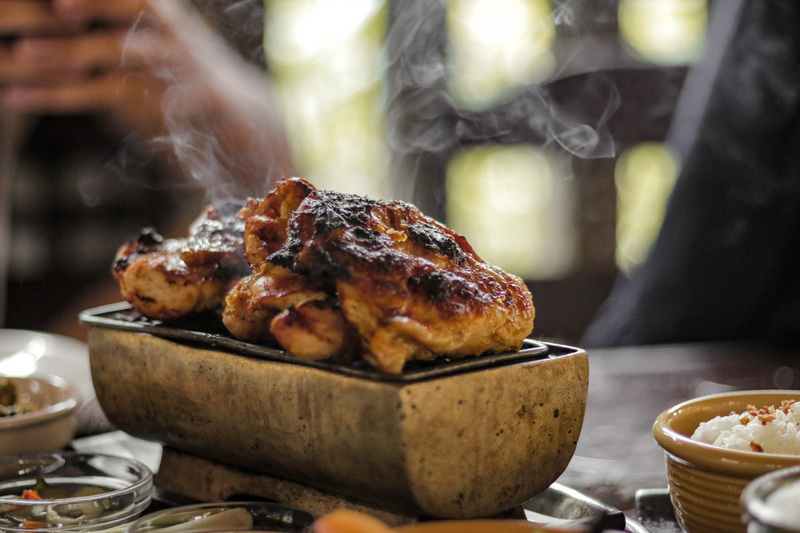 We had authentic Balinese food, which included sate (satay) that were served in mini charcoal grills. New Moon Cafe at Jimbaran Beach is a hot favourite among tourists. It’s here where you get good views of the beach (gorgeous sunsets) on top of good food. 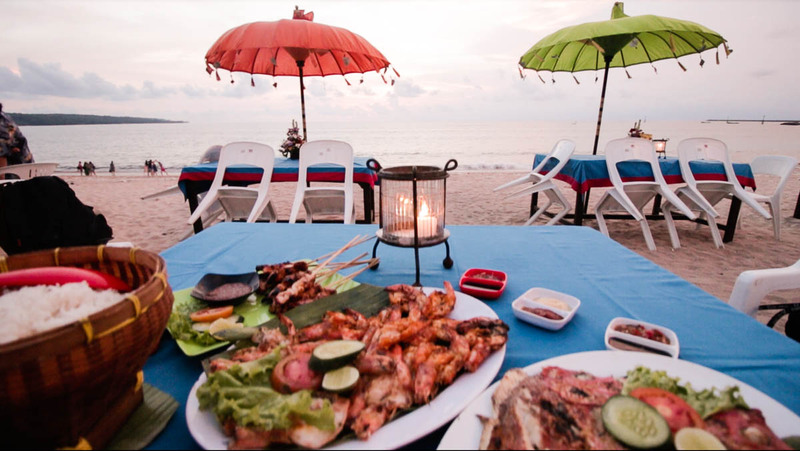 A scrumptious meal inclusive of grilled snapper, prawns, satay, and fresh fruit juices costs around Rp1.3mil. 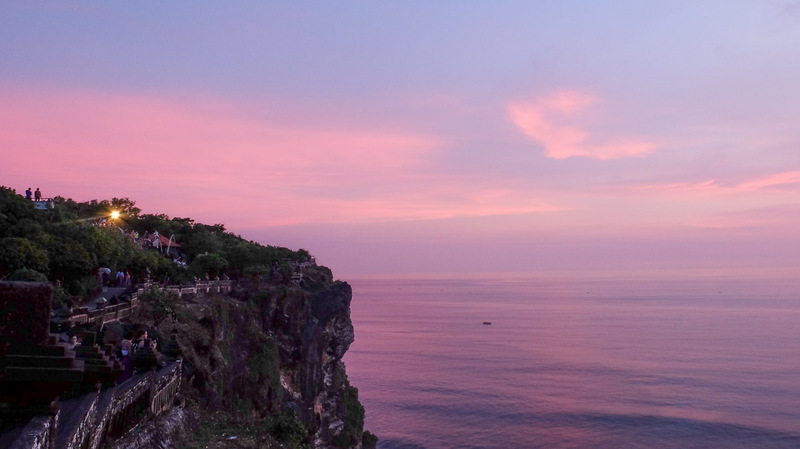 That may sound pricey for Indo food, but the sunset views you get to enjoy are priceless. 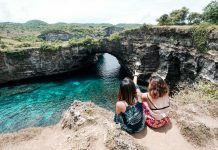 With this guide on Nusa Dua and Uluwatu, we hope you’ll conquer the lesser-known area of Bali, and experience our all-time favourite getaway differently. For more travel inspirations, follow us on Facebook, Instagram, and YouTube.